Oct 24, 2014. When did the National Debt go crazy? Why? Who’s to blame? Where is the debt headed? Compared to the US economy, the national debt is smaller than it was after World War II. But, take a look at what could have happened if three presidents had balanced their budgets. Oct 24, 2014. What if Reagan and the Bushes had balanced their budgets? How much lower would the debt be now? We’ll get to that shortly, but first, how did we get into this mess? This may just be the weirdest political tale you’ve every heard. World War II cost a bundle, and the country started out in the Great Depression. It was flat broke. But Uncle Sam was popular and the country patriotic, and people were happy to lend him money. Compared to the size of the economy back then, the debt soon outstripped even today’s debt, and we won the war. After the war, they started paying off the debt, and the economy (and its GDP) grew. And for 35 years the debt kept getting smaller compared to the GDP. When it was the smallest (as compared to GDP) than it had been in 50 years, Reagan was elected (1980) and vowed to shrink it even more drastically. But he had an odd theory: Cut taxes and the government would collect so much more money that he could spend more and still pay down the debt. Even before he was elected, George H. W. Bush called this “Voodoo economics,” and so it was. So how the heck did this happen to the guy that rode to office on complaints of an out-of-control debt that was as big as a stack of $1000 bills 67 miles high? How did he come to add another 128 miles to that stack? Reagan took some economics in college, and he really did want to reduce the debt. But he got snookered by some Wall Street “economists” (mostly political journalists) who told him he could have his cake and eat it too. They came up with the brand-new theory, mentioned above, that said the government can collect more money by reducing taxes. Wouldn’t that be nice! That’s the supply-side economics that George H. W. Bush called Voodoo. It was first tested by Reagan. Bush I tried and failed to undo the Voodoo, and Bush II reinstated it after Clinton. Altogether there were 20 Voodoo budgets. And every single time the debt not only went up, it went up faster than the economy grew — usually much faster. Before the Voodoo, 26 of the previous 35 budgets resulted in the debt shrinking relative to GDP. Reagan’s first budget was the turning point. Debt: Total owed from past and present borrowing. Deficit: This year’s borrowing. So how big is this supply-side / Republican debt? My answer is not entirely fair, because I calculate it by the Republican method, but it seems fair to hold them to their own standards. And it makes the calculation transparent and understandable. You be the judge. So just what is the Republican approach? There should always be a balanced budget — they even want to put that into the constitution. As Ron Paul said, they are the party of balanced budgets. So we will ask, “What if Reagan and the Bushes had balanced their own budgets?” And what if Clinton and Obama had taxed the same and spent the same as they actually did? The answer is that the National Debt would now be lower by $13.5 trillion! So that’s the Republican National Debt — according to their own standard of balanced budgets. It’s quite easy to check these calculations (see this spreadsheet). They go like this: When Reagan took office the debt was $1 trillion. When he left it was $2.86 trillion. So $1.86 trillion for him. Then Bush-I added $1.55 trillion. Total so far: $3.4 trillion. Then Clinton took over. Now the national debt is like a mortgage, and so the bigger it is, the more interest must be paid on it. Without the extra Reagan-Bush $3.4 trillion, there would have been a few hundred billion less in interest on the debt every year under Clinton. That interest adds another $2.3 trillion to the Reagan-Bush debt. Then Bush II increased it by $6.1 trillion to $11.8 trillion. And interest on that has been increasing the debt under Obama. 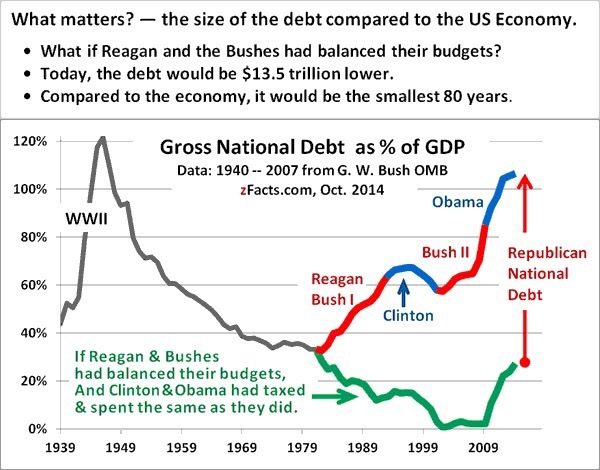 The total Reagan-Bushes debt is now $13.5 trillion. Supply-side economics is outrageously dishonest. The supply-siders didn’t even mind conning their own man Reagan. The tax-cut “theory” only actually applied to the rich. So the plan was to cut tax rates for the rich in half, which they did. To get this through they had to cut taxes for the middle class some too, but they counted on inflation pushing the middle class back into higher tax brackets. But cutting the top bracket had a permanent effect because there is no higher bracket to get pushed into. So not only was cutting taxes to raise money crazy, it was just a deception to cut taxes for the richest and then use the deficits to force cuts in services for the middle class and the poor. The Republicans have almost all gone over to the supply side now, and many, like Reagan, have been brainwashed into believing it. G.W. Bush claimed he would “retire nearly $1 trillion in debt over the next four years. This will be the largest debt reduction ever achieved by any nation at any time.” I think he actually believed that. When the Voodoo started, that’s exactly when the debt went out of control. And 20 out of 20 budgets can’t be an accident. Especially when you consider that Clinton was handed a Voodoo budget headed in the wrong direction, stopped that, turned it around and ended up with the debt reduced from 66% to 58% of GDP. Notice how the debt accelerated during Bush’s last two budget years. Obama’s debt is a continuation of that trend and neither Bush nor Obama are directly responsible for that acceleration. It happened because of the recession. (Bush was responsible for the turn-around from surplus to deficit soon after he took office, but not for the impact of the recession on the budget.) Nonetheless, Bush set the all-time record by increasing the debt by $1.1 trillion in 100 days between July 30 and Nov 9, 2008—but that had little to do with his choices. Recessions cut tax revenues—in this case, dramatically. That accounts for nearly half of the deficit. So blaming Obama for the full deficit is like blaming him for not raising the tax rate to keep tax revenues up. Most of the increased spending is automatic increases in unemployment benefits, food stamps, and social security payments for early retirement. Very little of it is from stimulus spending, and that’s over. Now we see that the economy is growing almost as fast as the debt, so in the last year, the debt has not outstripped economic growth by much. Economic growth is the main way that the WWII debt was brought down relative to GDP.